Between 12th to 14th March 2019, a joint general assembly of the two Horizon2020-funded projects CHE (CO2 Human Emissions) and VERIFY (Verifying Greenhouse Gas Emissions) took place at ECMWF in Reading, UK, with over 110 scientists and stakeholders attending. The CO2 Human Emissions (CHE) project coordinates efforts towards developing a European monitoring capacity for anthropogenic CO2 emissions. VERIFY develops a system to estimate greenhouse gas emissions to support countries' emission reporting to the UN Climate Change Convention Secretariat. The three-day event was co-organised by the two projects to boost synergies and increase collaboration, with each project having a dedicated day interspersed by a joint “Science Day”. Day 1, focussing on the CHE project, was opened by ECMWF Director-General Florence Rabier with a Welcome address highlighting the importance of the CO2-related activities to ECMWF. 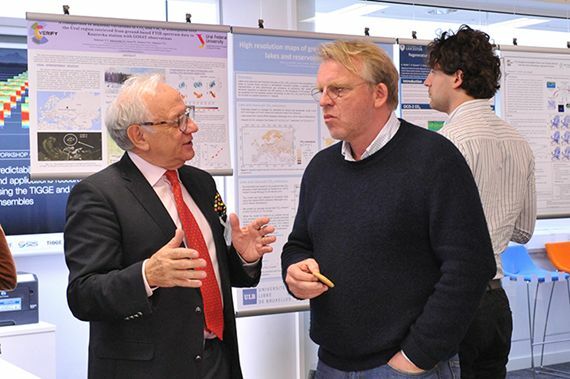 This was followed by presentations by the European Commission’s Hugo Zunker and Bernard Pinty, who outlined the Vision for a CO2 Monitoring and Verification Support (MVS) Capacity within the framework of the EU’s Copernicus Programme. This was followed by a presentation of the CHE EU Project Officer Monika Kacik, providing an overview of the H2020 plans related to the CO2 MVS, including the potential follow-up project for CHE. The first day was then wrapped up by feedback provided by the chair of External Expert Group, Peter Rayner, and the chair of the External Advisory Board, Han Dolman. The day was concluded by a presentation of Richard Engelen (ECMWF) on the operational perspectives of the CO2 MVS, with a first view of the operational setup informed by the expertise gained in the Copernicus Atmosphere Monitoring Service (CAMS). Both Day 1 and Day 2 included poster sessions where participants presented their research in relevant areas. The final day was wrapped up by a presentation and discussion on data integration and data flow for 2019, as well as feedback from the external advisory board, presented by Yasjka Meijer, ESA. Presentations and posters from the General Assembly, as well as recordings of the science day, are available at the events page. An article on the event has also been published by ECMWF here.